As the days get longer and the late winter sun grows stronger, families and farms in eastern Canada turn to a time-worn tradition: tapping trees. 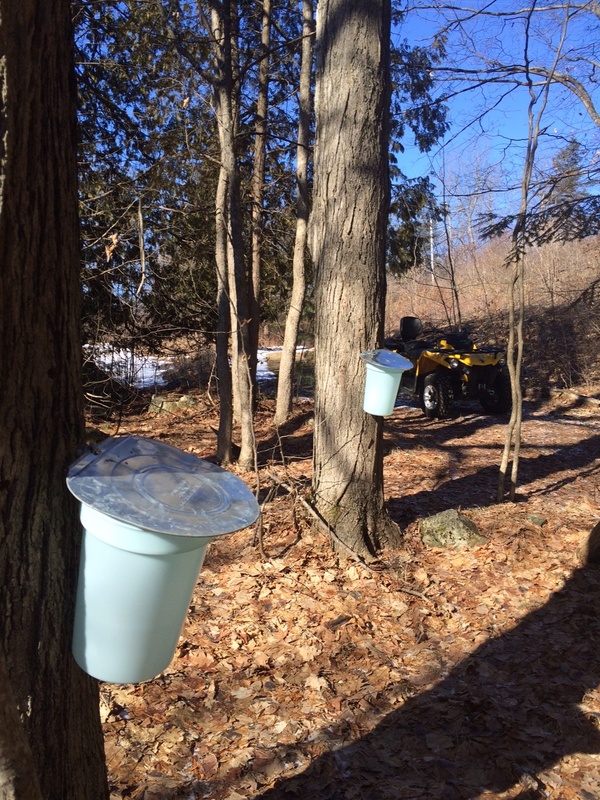 Since moving to Eastern Ontario twenty years ago, I have spent many a March in the sugar bush. In the early years, it was tapping trees and boiling sap in the sugar shack at my best friend’s farm in Parham. 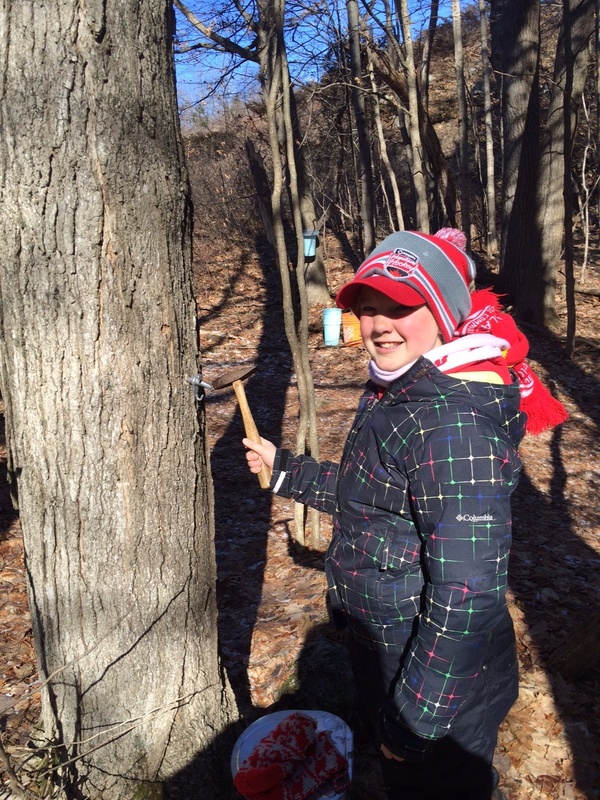 For the past four or five years, we’ve tapped a half a dozen maple trees on our property– something fun to make the endless month of March pass by quickly and to teach the kids about being sustainable. Unless you’ve made maple syrup before, you can’t truly appreciate the work and effort that goes into making that precious one litre of liquid gold. I remember one year, when the kids were just babies, Leslie and I wading through thigh-high snow, dragging the kids bundled up in snowsuits and scarves behind us on the toboggan to tap trees. We didn’t even make it halfway to the sugar shack before giving up because the snow was so deep. Then there is the lugging of the buckets. On our property, the maple trees are down at the lake. We store the sap and boil off outside the barn. That means lugging heavy buckets full of sap daily up our big hill. I swear by the end of the season, my arms are about two inches longer than they were at the start of the season. Finally, the hours and hours of boiling until you hit that critical moment when the sap thickens into syrup and you can sugar off. Most people don’t realize how critical the timing is. Wait too long, and you have crystallized candy on your hands. Sugar off too soon and you’ve wasted hours of boiling to create runny syrup. Luckily, we learned how to determine the perfect consistency and exact time to sugar off from the very best—Audrey Tarasick, Leslie’s mother. Audrey would stand over the evaporator with her silver ladle, testing every five minutes how thick the sap was by seeing if the liquid formed a half moon drop on the end of the ladle. If it did, the sap was ready to sugar off. For us, I’ve calculated it costs us about $80 in propane to get our 4 litres of maple syrup. Sure, we could buy it cheaper, but the fun and memories it’s given us over the years are priceless. This week’s #HappyAct is to tap into some liquid gold this month. 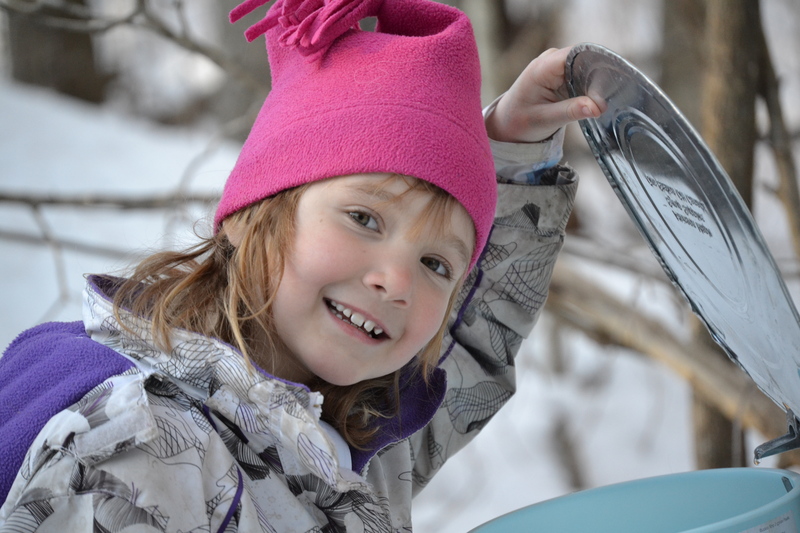 Little Cataraqui Conservation Authority’s Maple Madness runs this year from March 11 to 19 (March Break), and on the weekends of March 25 and 26 and April 1 and 2. One litre of syrup will run you $26.25. Could world happiness end global poverty and lead to world peace? Great job as always Laurie.